Around the houses racing started in Bunbury in 1938 with the running of the Bunbury Flying 50, the racing was held on the large town circuit as it was known, run in a anti clockwise direction, on the day the events included car and motorcycle events, The race was run again eight years later in 1946 on the same circuit but in a clockwise direction. 1938 - Car and Motorcycle racing events. Photos: from the Ray and Brad Repocholi collection taken from Koombanna Hotel. 1938 - E Harris in the Hudson Terraplane takes the left hander at the base of Boulters Heights. Photo: Lost Perth facebook. 1938 - E Harris slides through a corner in the Terraplane Special near the Railway yards. Photo: Lost Perth. 1938 - E Harris in the number 2 Hudson Terraplane charges towards the finish line while the crowds cheer him on. Photo: Ray & Brad Repocholi collection. 1938 - The finish line out side Victoria House. Bunbury's high rise tower now sits on this spot. Photo: Deon McCellan. 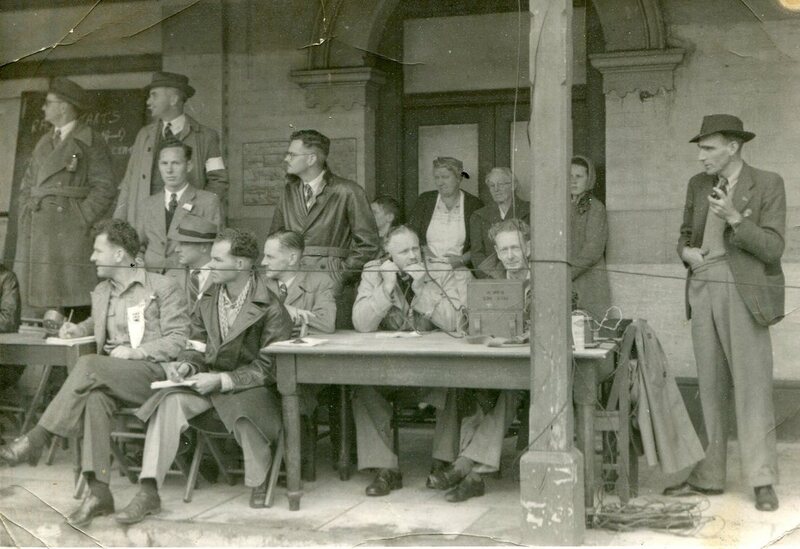 1938 - The timing officials set up outside Victoria House (now the Bunbury Tower) In the picture is George Roberts, Laurie Harvey, Harry Eastman, Ken Lee, Tom ? ?, Jack Best and Rodney Johnston. Photo: Michele James collection. After World War 2 the Bunbury Flying 50 was held for the second time on the 11th of November 1946 on the same circuit as the 1938 event but in a anti clock`wise direction, once again the programme would feature car and motorcycle racing, This Flying 50 event would be part of the back to Bunbury weekend, the program for the day would start with the motorcycle sidecar TT event at 11.15 followed by the Flying 50 race for cars at 2.30 and then the flying 50 race for solo motorcycles at 3.45, the results for the flying fifty for cars were 1st Barry Ranford in the number 6 Ranford Special who completed the race in seventy four minutes and forty five seconds, 2nd was Wally La Motte in the number 12 Ford V8 and third was Ted Harris in the number 10 Plymouth Special, the fastest lap went to Duncan Ord at two minutes ninteen seconds in the number 9 Bugatti, unfortunately Ord failed to finish. Other attractions featured over the back to Bunbury celebrations were, a soap box derby, motorcycle and horse gymkana as well as a Grand Ball on the Monday night at the Lyric Ballroom. 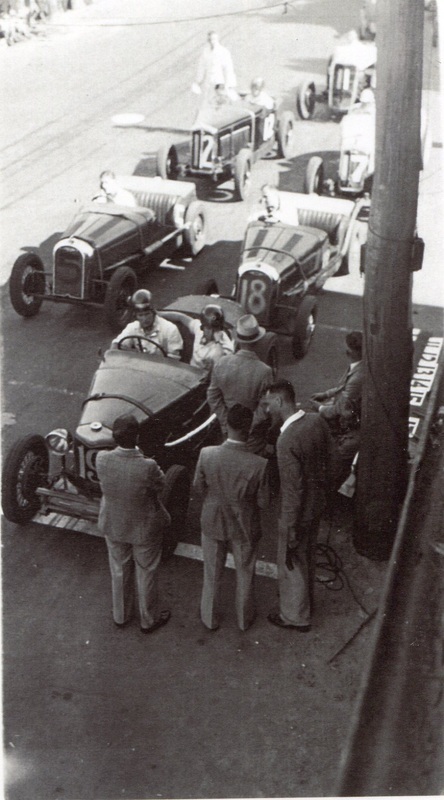 1946 - #16 Sydney Anderson Austin Meteor, #17 HH Vaque San Sebastion Special, #11 Vic Hodson Worsley Hornet, #14 Bill Smallwood Austin 7 (inside row) #12 Wally La Motta Ford V8 Special, #6 Barry Ranford Ranford Special and rear is Duncan Ord Bugatti, Photo: Ken Devine. Research: Don Collins. 1946 - Barry Ranford in the number 6 Special is pictured at the finish next to 3rd place Wally La Motte. Photo: Camera Craft Perth. 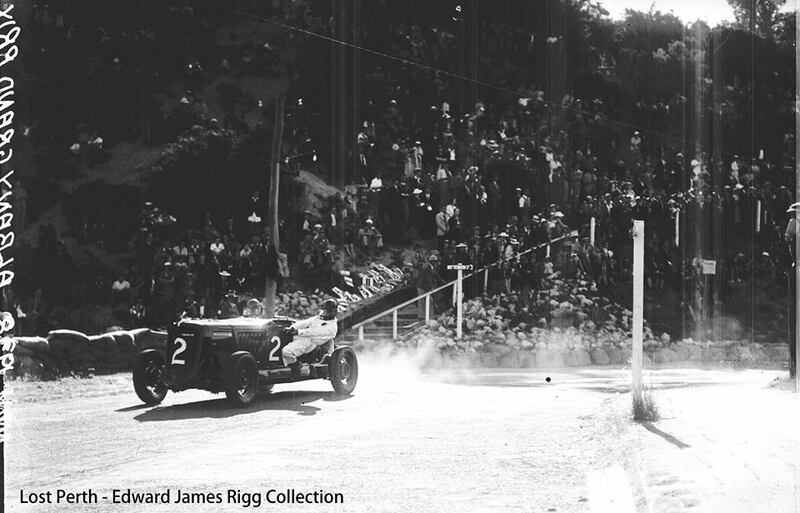 1946 - W La Motte in the 12 car leads S Barker through the uphill right hander at the base of Boulters Heights. Photo: Camera Craft. About ninety five percent of the original track layout is still the same, the main changes are are the original street were the race was run has had many traffic islands and round a bouts installed, the other major change is the re alinement of Upper Esplanade were it joins Ocean Drive, long gone are many of the homes and guest houses that played a big roll in Bunbury's life after the war, The reason being for all this accomodation, There were very few cars around after the war and the main population of Bunbury lived and worked in and around the town centre. Many of the origial hotels and shops around the circuit are still in use today but most have been up-graded and many have gone through name changes. work in progress - coming soon. 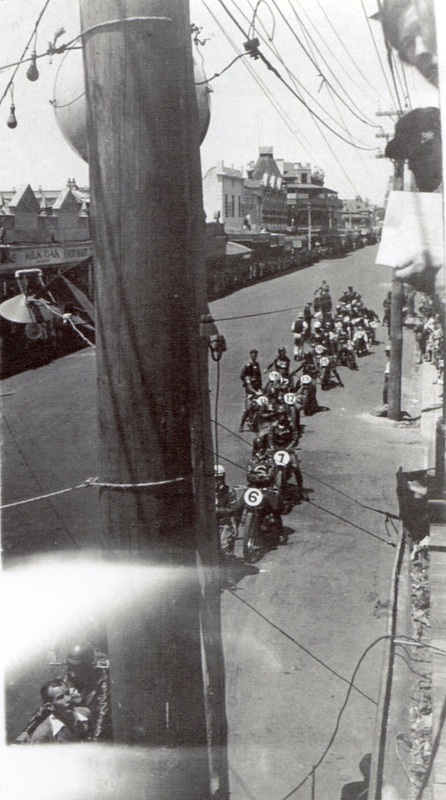 The 1950 Australian Motorcycle TT was held in the central Bunbury area on the 8th of April 1950. The scene on the hill in Princep Street just before the start of the Derby on Saturday last conducted by the Apex Club of Bunbury, The winner can be seen fifth from the right, that Bat car on the left was built by Max Cook in the car and Jim Renfree at the rear. The 1954 Easter TT was held on Monday the 19th of April 1954, The meeting was conducted by the Bunbury Motorcycle Club and was run on the Glen Iris big circuit. This around the houses meeting on the streets of Carey Park was held on the ﻿21st ﻿of ﻿December 1958. The .95mile sealed circuit was reported as being very tight and quite bumpy, The was the one and only time Tg's raced on the streets of Bunbury. 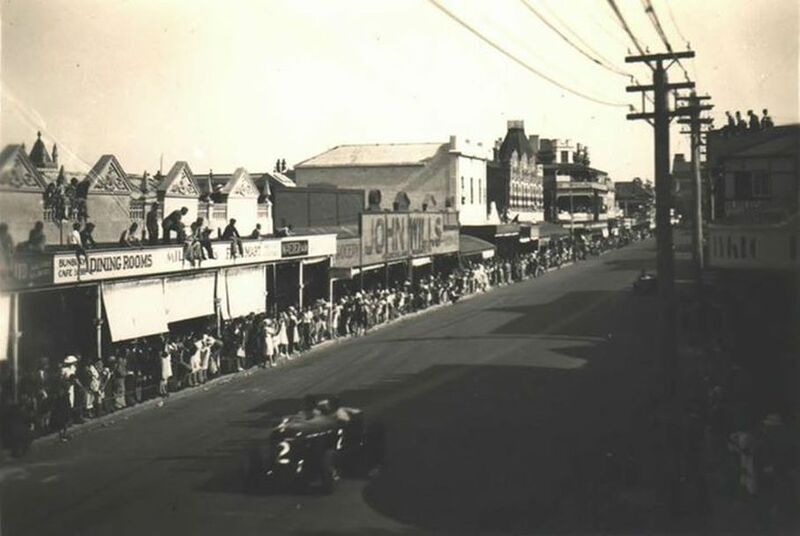 Not since 1947 had car racing been held on the streets of Bunbury, because of the relative isolation of the Carey Park suburb south east of the town centre it was decided to run the event there, the cars were mainly production type cars with two ex works racers in an Aston Martin db3s driven by Ray Barfield and a Ferrari driven by Doug Green competing. Doug Green in the number 12 Ferrari on the Carey Park circuit. The Carey Park circuit is no longer that quite vacant suburb that it was when the Flying Fifty event was held there. Ray later moved his business to Spencer Street in Bunbury and traded as South West Power World. The Bunbury Motorcycle Club hosted the Bunbury Grand Prix around the streets of Moorelands, also known as Glen Iris from the 26th of December 1963 until the Easter Saturday of 1974 , the program consisted of motorcycle and sidecar racing. The 1961 Carousel Speed Festival was a major two day event, With holding the Australian Motorcycle Grand Prix on the Sunday, and the West Australian Sporting Car Club "Around the houses" racing on the Monday, They meeting was held on the Glen Iris circuit, but on a shortened layout. 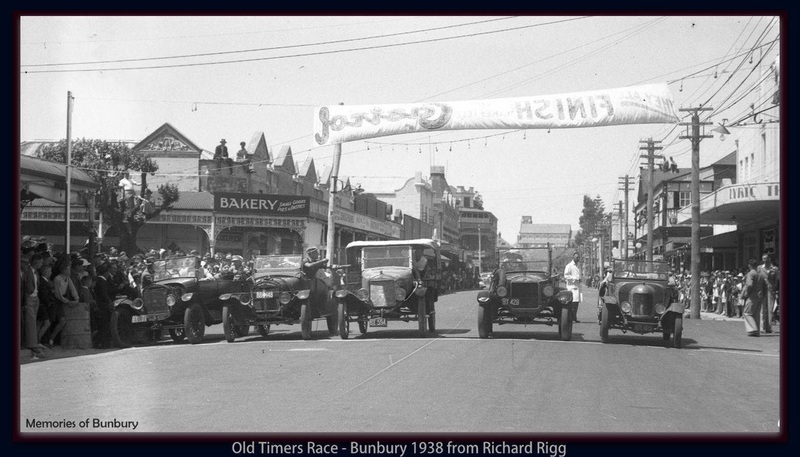 In 1962 the Bunbury Motorcycle Club played a major role in staging the 1962 Australian Motorcycle TT Championship, the racing was held around what was concidered to be a central Bunbury layout. 1962 - An unknown rider powers on through the blind man corner on Spencer Street, Doctor Foster's surgery can be seen in the backround. Photo: Tony Forsyth collection. Gary Whitcombe recalls: In this photo my grand farther Bill (William) Whitcombe was the chief organiser for this event, His bike won the 125cc event and came third in the 250cc event, The bike was ridden by George Scott who was an international renowned rider in the day. Bill started the Motorcycle Racing Club of WA and was its first life member, Along with winning the 1962 Aussie TT his bike was to come second in 1963 and 1994 and at one stage it held the Australian 125cc speed record. Dad was fortunate enough to race the bike when time and money permitted, I can remember racing down the main straight with dad at Caversham whilst sitting on the tank when I was just a nipper. 1962 - Bike owner Bill Whitcombe pushes away his rider George Scott on the Honda 125 machine at the Australian TT on the streets of Bunbury. Photo: Gary Whitcombe. 1962 - Harley Pederick 64 Stan Starcevich 56. Photo: Ken Devine collection. The Carey Park circuit is no longer that quiet vacant suburb that it was when the Flying fifty was held there. 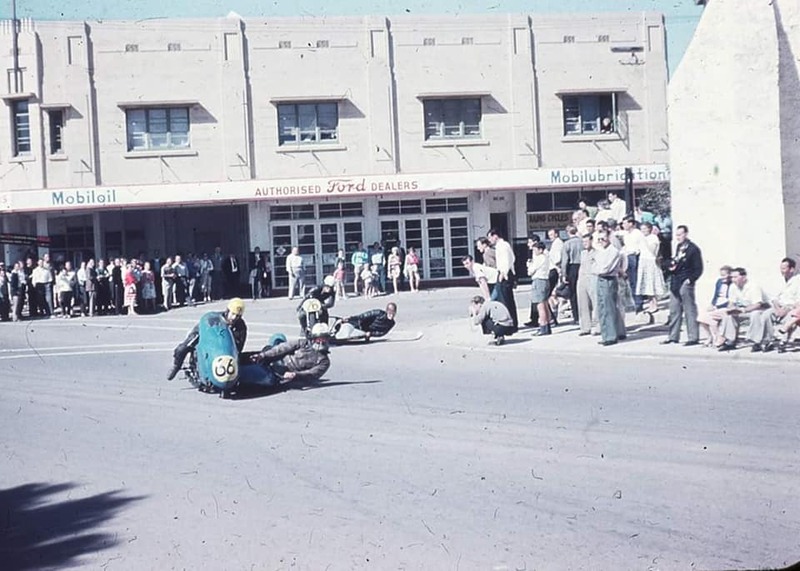 1963 - Local Bunbury driver Jim Renfree in his 1100cc Fiat on the streets of Bunbury. Photo: Ken Devine collection. On Boxing day of 1963 the Bunbury Motorcycle Club held the Bunbury Motorcycle Grand Prix on the streets of Glen Iris, the circuit was was was known as the Little Glen Iris circuit, the racing consisted of Motor Cycle and Sidecar events. Bunbury business man and car restorer Newton Roberts restored the Salmson Sebastian Grand Prix racecar, here the car is pictured outside the original Picton Hotel. M Walker riding his 250cc Ducati corners in classic style during the running of the Bunbury Grand Prix meeting over the Glen Iris circuit on Sunday. Bunbury riders dominated the Grand Prix. Brian Cartwright won from Robert Page with the outstanding Bunbury scramble rider Glen Britza fourth. The field roars away to a good start at Glen Iris on Sunday morning in the practice event for the sidecar races later in the day. Practice sessions were held during the morning but after lunch it was on in earnest. The Bunbury Motorcycle Club hosted the third round of heats for the state road race series in 1972 around the Moorelands circuit, the program consisted of motorcycle and sidecar racing. The Bunbury Motorcycle Club hosted its 1973 Motorcycle Grand Prix on the Glen Iris small circuit on the 21st of April 1973. The Bunbury Motorcycle Club Hosted the third round of heats for the state road race series on the easter Saturday in 1974 around the streets of Glen Iris, the program consisted of motorcycle and sidecar racing. With the building of the Bunbury to Perth by pass road the circuit has been cut in half, about were the original minor road passed by Ray Trebley's property, the west side has been taken over by the Port Authority for future expansion and over time all but one home still remains. The east side remains unchanged, the road is still the original width and surface with many of the original homes still very well maintained. The Bunbury Motorcycle Club hosted the forth round of heats for the state road race series on the 29th of March 1975 around the streets of Bunbury's industrial area Davenport, the program consisted of motorcycle and sidecar racing. The Bunbury Motorcycle Club hosted the second round of heats for the state road race series on the 29th of Febuary 1976 around the streets of Bunbury's industrial area Davenport, the programme consisted of motorcycle and sidecar racing. The Bunbury Motorcycle Club hosted the second round of heats for the state road race series on the 6th of March 1977 around the streets of Bunbury's industrial area Davenport, the programme consisted of motorcycle and sidecar racing. Results for the 125cc championship was 1st Wayne Patterson, 2nd Lester Aizlewood and 3rd John Cockburn. 1977 - Start of the 125cc event Steve Rowe 158 - Lester Aizlewood 72 - Jim Nisbitt Snr. Photo: Lester & Nola Aizleworth. 1977 - Wayne Patterson 75 leads John Cockburn 82 followed by Lester Aizlewood 72. Photo: Lester & Nola Aizlewood. The entire area is a thriving industrial area with not a vacant block to be seen unlike the sight that greeted the competitors and public in 1975 and 1977, a vacant wind spept sand pit with a road around its and another cut through the centre, this road being Proffit Street and the current home for the South West Times. Mark Boyce with his "baby"... the $1800 dirt bike on which he outshone his 1988 road racing rivals. MARK Boyce of Bunbury has emerged the unsung hero of WA motorcycling in 1988. The 28-year-old electrical contractor began his first season in road racing "as a bit of a dare". He went on to win the prestigious Prince of the Golden West motorcycle racing series. Boyce, whose only contact with "fast track racing was as a lad astride a big Yamaha "before the days when police were out in force", clinched the prince series at Collie where several of the state's best riders failed to complete because of the dangerous conditions. Quite and unassuming Boyce admits he is not well known in the racing scene, In fact, even the Motor Cycle Racing Club secretary in Perth failed to realise the winner of the Prince series came from Bunbury. Perhaps the most surprising feature of Boyce's win was not that it was his debut season, but he rode an $1800 ex dirt bike on a very tight budget, He pitted a motocross bike, formerly used in the Manjimup 1500, against the powerful racing models, worth in excess of $12,000, ridden by competitors having years of racing experience. Adapted with a small front wheel, a big disc brake and high ratio gearing, Boyce's machine was backed by local sponsors including Ray Buck Motorcycles, South West Detailing, Stirling Refrigeration and Boyce Hydraulics. Competing against the likes of the 'King" winner Anthony McFadden and Owen Coles (who is off to Daytona in the USA) did not deter Boyce. "We were just from Bunbury with our trail bike" Boyce said. "We don't know any of them either but just go there, ride and come home again"
After Bunbury, Donnybrook, Minengew, Wanneroo and Kalgoorlie, the last round of the year proved the decider of the "Prince" series for C and D grade riders. Boyce a division two rider entered the Collie round just ahead of his main rival - Perth rider Reg Bruce, Bruce onboard a 350cc Yamaha GP, experienced machine trouble allowing Boyce to take the title with a fourth and a second. During the course of the year, after a seventh place in the opening round at Bunbury, Boyce finished in the top three seven times. For Boyce the season has been a lot of fun but admits finding road racing dull compared to the rigours of his former motorcross days. "Its boring, As much as I hate to say it, especially Wanneroo which I think is the worst", he said. He plans to defend his title next year on the same bike, They will have to fight me for it if they want it from me, he said. Circuit racing to Boyce is a little monotonous and a far cry from the more physical aspects involved in dirt racing. Although he doesn't aspire to the dizzy heights of fellow countryman Wayne Gardiner, Boyce will continue his winning formular of "riding within your limits, be sensible and don't go crazy". His battle-scared machine, which can be converted quickly for weekend hacks in the bush, has been frowned upon on the grid by some racers. "Its a bitza" he said "We were definitely the cat among the pigeons and not the most popular people"
He says fellow riders on board faster and far more expensive machines, could not keep pace with the motocrosser which was lighter, more manourvreable in corners, quicker to accelerate and had superior handling. "With that sort of thing you could hit a curb at 80mph and wouldn't feel it", he said. "Its quite amazing to line up with half the machine they've got and incredible to see you can beat them". After defecting to the Kawasaki camp from owning 11 Yamaha's. Boyce was delighted with the performance and reliability of the machine. He did experience a close shave at Donnybrook, where a brand new chain broke at the end of a straight , threatening to lock the rear wheel after slowing from speeds of around 200kph. The engine was badly damaged and he relinquished a top place after gaining a second place earlier in the day. "I'm the boss of the bike and that's what I like", Boyce said. "Next year, we might put a new spark plug in it and it might even go a bit better".